1 Screen Platformer, from Return to Adventure Mountain, is exactly what it sounds like... a platformer that takes place on a single screen. 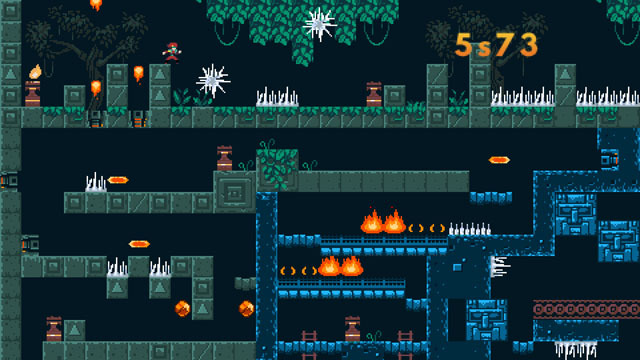 Fortunately, you can also zoom in on the action and play the game in a more traditional fashion, similar to the gameplay offered in Platformance: Castle Pain and Platformance: Temple Death. While the small game world makes for a short experience, there are a number of reasons to replay, such as going back in for a faster time, a better rank, or to try the harder difficulty setting which adds faster obstacles in higher numbers. But the main reason to replay is to try out each of the four playable characters. Not only do some characters offer new abilities, like a double jump, each has different mission objectives, with one simply tasked with reaching the end as quickly as possible, another that collects glowing orbs to activate checkpoints, and one that has to reveal the area by clearing fog-of-war-style shadows. The game is now available for PC and Mac via Steam for 99 cents. Check our coverage here.